A war memorabilia collection including distinctive Nazi medals have been stolen in a burglary in Warwickshire. One man conned his way into an elderly lady's home in Dordon, near Atherstone, saying he was from the water board. A second man is thought to have sneaked into the home while the woman was distracted and stole up to 70 items, including medals and cash. Warwickshire Police have released an artist's impression of the man who conned his way into the home. He is described as a white male aged in his early 20s with dark hair and between 5ft 6in and 5ft 10in tall. 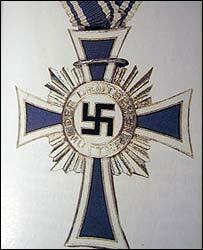 A silver German Mothers Cross, with distinctive Nazi symbols and given to women who bore six to seven children during World War II, was taken in the burglary on 24 August. Also taken were wound medals given German soldiers who were injured in combat along with cap badges from British and German soldiers and medals given to police officers and fire service officers going back 50 years.